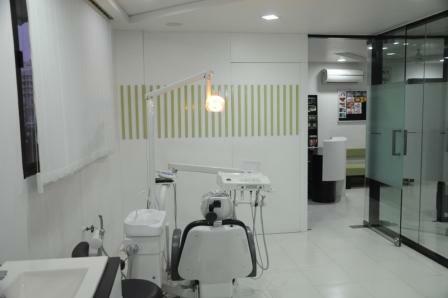 “ivories” is a multi-speciality laser dental clinic and dental implant center of India, based at Ahmedabad, Gujarat, India created with a mighty combination of ultra modern dental technology and artistic hand skills of their lead specialist dentists – Dr.Alaap Shah And Dr.Kinjal Shah, paving way for a clinical environment that is both – result oriented as well as patient friendly, such that it can alleviate the fear for dental treatments. The clinic’s environment re-instates the significance of total dental care, as the dentists believe that a balanced oral + dental health is the gateway to healthy human body. At ivories , it is believed that a relationship with a patient begins with his/her very first dental inquiry by an email or a phone call, which then generates a platform for long term bonds, by overcoming their apprehension for dental treatments and worries of dental treatment costs. The clients thereafter realize that their dream of a confident smile and a desire for regaining his / her original [natural] eating [chewing] efficiency , could see the light of the day. 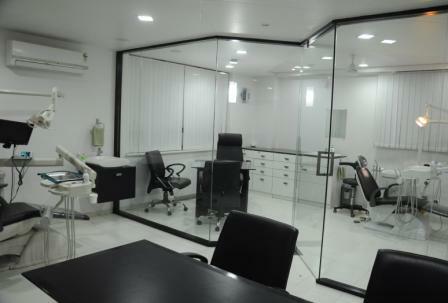 At ivories , it is of utmost significance for the lead specialist dentists and the ancillary staff to make sure that the entire dental center, beginning with the waiting lounge to dental operatory area, is absolutely hygienic and does not give an impression / perception of a typical hospital. The disinfection protocol at the dental center is strictly adhered to as per the norms laid down by international bodies /dental councils. In any dental examination or a procedure, Single use disposable items are immediately disposed, in front of the patients, to guarantee the code of conduct for sterilization at the dental center and the non-disposable steel equipments are thoroughly processed to make them germ-free by the standard four step sterilization. The increasing cost of healthcare overseas has motivated people to lookout for treatment options worldwide with cost effectiveness and at par treatment quality. India, and specifically, Ahmadabad has emerged as a leading destination for medical and dental tourism for one and all, because of its state of the art technology and relatively affordable treatment costs. IVORIES DENTAL CLINIC & IMPLANT CENTER has earned a repute of its own for dental tourism for patients from USA, CANADA, UAE , UK , AUSTRALIA, etc…for their dental needs especially dental implants and cosmetic dental treatments which are exorbitantly costly in their home country. Our patients have realized that their sum total of airfare, dental treatment costs, touring and even shopping in INDIA, has been atleast 8 – 10 times less than just the treatment costs in their home country. To ease their entire visit, we have a dedicated travel desk which provides services to the patients for planning their trip to INDIA primarily for their dental treatments , supplemented with touring and sightseeing within GUJARAT and INDIA as a whole [if desired]. We call it a dental vacation, rejuvenation of oral health and a tryst with nature, culture, heritage, cuisine, music and festivals, architectural prowess of AHMEDABAD, GUJARAT AND INDIA. One has to just provide the dental problem description and the tentative period for which he / she may be able to come. Everything else may be planned for and around the dental treatments required for the concerned patients in accordance with their suitability. Conclusively, skillful dentistry by DR ALAAP SHAH and DR KINJAL SHAH and state of the art technology at IVORIES DENTAL CLINIC AND IMPLANT CENTER offers to the INDIAN NATIONALS, NON-RESIDENT GUJARATIS , NON-RESIDENT INDIANS , and FOREIGN INDIVIDUALS , highly professional dental services of international standards garnished with a soothing, pain relieving warmth and personalized care. Gujarat is is very beautiful & colorful places. The state is bless by God with It is fertility, lush green forests, various enchanting rivers, beautiful plains, the hill ranges and exotic villages & friendly people. It is the second-most industrialized state after Maharashtra. Gujarat is one the most prosperous states in India, forming as it does the most industrialised corridor between the Town of Mehsana in North Gujarat and Bombay in Maharashtra. Its original wealth stemmed from its roots in textile industry that is now nearly dead and defunct. However, due to that history, some of the world's best textiles and dress materials are still found only in Gujarat. Gujarat is also the home to the almost extinct Asaiatic Lions. If there is just one reason you need to visit Gujarat, it will have to be the lions- the only wild population outside of Africa, and fast vanishing due to lack of variation in the gene pool. Another reason to visit Gujarat will have to be its rich culinary interests. Gujarti cuisine is one of the best tasting vegetarian cuisine in the world. Famous varieties include Dhokla, Khandavi, Khaman, Khakhara, Shakkarpara, Muthia, Bajri Vada and Bajri Dhebra. Gujarati sweets are also as famous, as are Gujarati Rotlas. Third reason to visit Gujarat will have to be its rich shopping of exquisite clothes, textiles and hand made or woven or hand decorated fabrics and clothes, beddings and wall decorations. Gujarat is a study in contrasts – Between Tribal Culture and Modern Cities, Between the Desert and the Seas and between a Rural based and Urban Economy. Location : Gujarat is the westernmost state of India. Gujarat is surrounded by the states of Rajasthan to the north-east, Madhya Pradesh to the east, Maharashtra and the Union territory of Dadra and Nagar Haveli to the south. It shares the international border with Pakistan, in the north-west. The western cost of Gujarat faces the mighty Arabian Sea. Rivers – The major rivers flowing through the state include the Narmada, Sabarmati, and Mahi in central and northern Gujarat; Mithi, Khari, and Bhogavo in Saurashtra; Tapi, Purna, Ambika, Auranga and Damanganga in the southern part of the state. National Parks – Gujarat is home to four National Parks, including Gir Forest National Park, near Junagadh, Blackbuck National Park in Bhavnagar District, Vansda National Park in Navsari District, and Marine National Park on the Gulf of Kutch in Jamnagar District. The last remaining Asian lions, famous for their dark black manes, live in the area surrounding Girnar. In addition to these, there are twenty one Wildlife sanctuaries. Ahmedabad :: Ahmadābād is the largest city in Gujarat and the sixth largest city in India . The city is also sometimes called Karnavati, an older name and as Amdavad in colloquial Gujarati. Ahmedabad enjoys a thriving cultural tradition, being the centre of Gujarati cultural activities and diverse traditions of different ethnic and religious communities. Daman :: Daman is a beautiful, stunning, striking, gorgeous paradise on earth. It was formed out of the dismembered Sultanate and was governed by Meli Moluk who governed the Throne of Cambay under which jurisdiction it fell. Diu :: Diu is an off – shore island on the western coast. The coast has limestone cliffs, rocky coves and sandy beaches, the best of which are at Nagoa. A massive fort built by the Portuguese dominates the skyline. Gandhinagar :: Gandhinagar is the capital of Gujarat State. Gandhinagar occupies an area 57 sq. kms. It presents a spacious, well designed look of an architecturally integrated city. 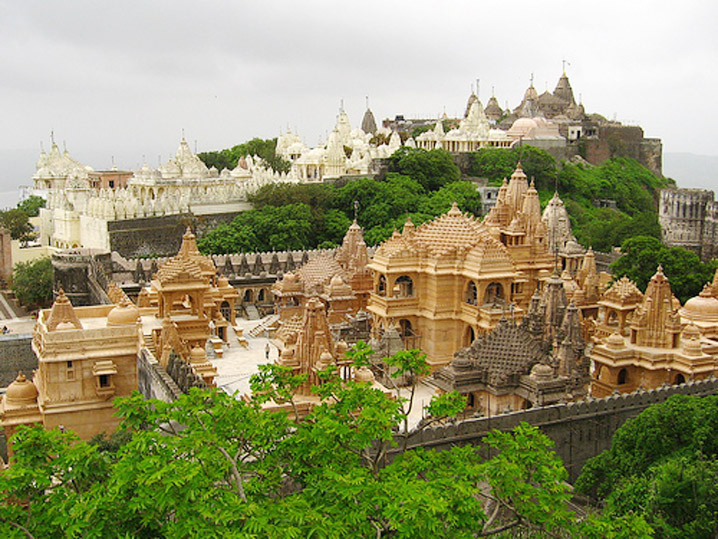 The famous temple of Swaminarayan is also built in Gandhinagar. Jamnagar :: Jamnagar is a city and a municipal corporation in the Indian state of Gujarat. Jamnagar has shot to prominence as Reliance Industries, India's largest private company established the world's largest refinery near Moti Khavdi village. Jamnagar district has a predominant Hindu population. Rajkot :: Rajkot was founded by Vibhoji, the younger son of Ajoji. The pleasant town is an important industrial area and a religious centre of the Arya Samaj. The city is famous because this is the ancestral home of Mahatma Gandhi. Mahatma Gandhi spent the early days of his life here is Rajkot. Sasan Gir :: Sasan Gir Lion sanctuary lies at the bottom of the Saurasktra peninsula in the western state of Gujarat. The forest is generally of a tropical dry deciduous type with teak as the principal species forming up to 70% of the crop. Silvassa :: Silvasa is the town capital of Dadra and Nagar Haveli Union Territory, western India. Silvassa has lush green forests covered with tall trees, meandering rivers, large waterfronts, cascading waterfalls and a gorgeous kaleidoscope of flora and fauna. The serene and sylvan land of silvassa is Nature at her best. Surat :: Surat is a port city famous for Sarees and textiles manufacturing. The city is situated on the left bank of the Tapti River. A moat indicates the dividing-line between the old city with its narrow streets and handsome houses and the newer suburbs. Vadodara :: Vadodara also known as Baroda is the third most-populated town in the Indian state of Gujarat. Vadodara is also known as ‘Sanskari Nagari’, means a ‘Cultured City’. Vadodara is one of India’s most cosmopolitan cities.